Our quilt project for June is simply delightful. The idea of peicing quilt shapes in 1/12 scale is simply daunting!! !, Instead, I decided to take those beautiful patterns and digitize them to be stitched in cross stitch. The results are fabulous!!! You get the look of a traditional quilt design, and the detail and fine craftsmanship of cross stitching. And it couldn't be easier!!! 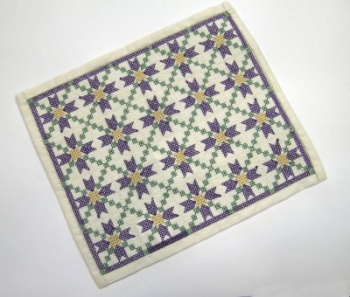 Students receive beautifully pre-embroidered quilt top, and fabric for backing and binding. This project can be completed by hand or by machine. The finished quilt measure 5" x 6". 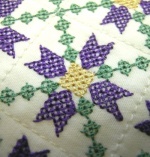 See photo below for an idea of the detailing of the stitching on this piece! Kits will begin shipping May 15, so that overseas customers can combine shipping on all three sets. Online chat session is scheduled for June 9.